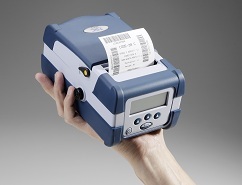 With its all-in-one design and 3-inch print width, the new TSCTM M23 lightweight portable bar code printer lets users address a wide variety of wireless applications – everything from item marking and shelf labeling to shelf talkers and portable POS – without investing in multiple devices. In addition to traditional uses, the M23’s 3-inch-wide design easily accommodates a variety of emerging wireless bar code applications, including shelf-talkers and point-of-sale receipts. And its wide print width makes it easy to print shelf-labels horizontally – saving time and money.